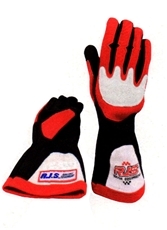 Driving Gloves, Single Layer, "Elite"
Manufactured from the highest quality material. Reinforced knuckle pad and flexible palm to reduce hand fatigue. 3.2/1 rated single layer. NOTE: Due to this product being SFI certified and dated they are shipped directly from the manufacturer.